Welcome to W8MD’s weight loss diet with 8 amazing weeks to weight loss and wellness. W8MD’s revolutionary medical weight loss program is based on the following 8 simple principles. 1. Understand that Obesity is a medical condition, not a personal weakness, and needs a physician trained in Obesity Medicine to help you lose weight and live healthy. 2.W8MD weight loss physicians understand that losing weight is a complex process that needs careful monitoring by an obesity medicine physician well versed with the concepts in obesity medicine. 3. In order to help you lose weight, the W8MD weight loss program aims to supply the body with nutrition at a regular interval with limited calories but adequate protein and other nutrition the body needs. 4. The simplest way to provide the balanced nutrition at very limited calories is to use prepackaged meal replacement diet plans such as Very Low Calorie Diet(VLCD) or Low Calorie Diet(LCD) plans. However, you can choose to prepare your own meals instructions from W8MD, should you feel you cannot afford or do not wish to use the Meal Replacement Plans. 5. When medically appropriate, any FDA approved prescription weight loss drugs or diet pills such as the new Phentermine and Topiramate (Qsymia), Loracaserin (Belviq), Bupropion/Naltrexone(Contrave), Liraglutide(Saxenda) or the traditional weight loss medications such as Phentermine(Adipex), Phendimetrazine(Bontril), Diethylpropion(Tenuate) etc. might be ordered by the weight loss physician as clinically appropriate. 6. Instructions on appropriate physical activity / exercise based on your body’s physical condition and your ability to lose weight. 7. Understanding the complex processes that contribute to weight gain including metabolic, hormonal, nutritional deficiencies, insulin resistance, eating disorders, sleep disorders, medication induced weight gain, genetic factors and devise an individualized weight loss plan that is right for you. W8MD Medical Weight Loss – How To Get Started? If Accepted, A Comprehensive Consultation With an Obesity Medicine Physician will be scheduled. The weight loss physician will perform a comprehensive medical history, diet history, lifestyles, sleep history, family history and perform a physical examination. The weight loss physician might also Order Blood Work and Other Simple Tests or obtain Copies of Recent Tests. Weight loss lesson for the week will be handed out. 15 or more minutes with Behavior Coach or Weight Loss Doctor. Weight loss lesson for week 2 will be handed out. If no, continue the program until goal or until other instructions from weight loss doctor. Start Maintenance once weight loss goal is reached. Having helped hundreds of patients lose weight safely, and effectively in our unique insurance physician weight loss and wellness program, W8MD can make a significant difference in your life! Read testimonials and external reviews or walk in and see for yourself! As 90 percent of all diabetes, 80 percent of all cardiovascular disease and 60 percent of all cancers are preventable according to research, it is important to take the first step and call W8MD at 1-800-986-3007 to see if you could be accepted! What have you got to lose, besides your weight? Trim down your waist, not your wallet with W8MD! 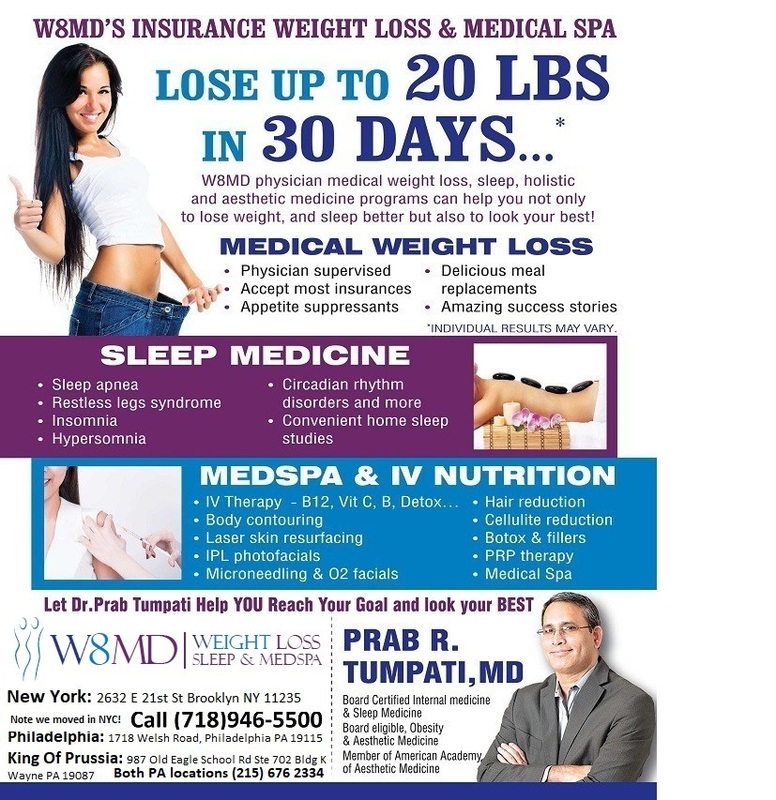 If you are looking to lose weight fast in NYC, Philadelphia or New Jersey, W8MD medical weight loss centers unique insurance physician weight loss and sleep wellness program should on top of your list! Check the amazing weight loss success stories! Dr. Tumpati makes each person feel special. I would highly recommend him to anyone that is serious about not only losing weight but improving their overall health , gaining knowledge about their bodies and nutrition and developing a healthier lifestyle. – A Philadelphia weight loss patient on Practice fusion. [… ]Wonderful history, believed we’re able to blend several not related data, however surely well worth taking a look for, whoa does a single examine regarding Core Eastern has considerably more problerms as well [… ]….